and featuring Tom Fulton*, Laura Perrotta* and Neil Kelly. SUNDAY, MAY 1, at 7 p.m.
A 42-year-old Israeli psychologist has her hands full as the single mother of a severely disabled teenage son. One day, a new client arrives for what becomes a desperate, no holds barred therapy session. Seems this Almighty stranger has given up on the world, with “issues” dating back thousands of years. OH GOD is a probing, funny and deeply moving work by beloved Israeli playwright Anat Gov (1953-2013). ANAT GOV was one of the foremost playwrights in Israeli theatre. Among her produced works produced at the Cameri Theatre in Tel Aviv: Happy Ending (2011); A Warm Family (2009); Oh God (2008); Househusband (2004); Lysistrata 2000 (2001), and Best Friends (1999). She was a translator of works by David Hare and Bertolt Brecht; a television writer and a journalist. SUNDAY, NOV 8, at 7 p.m.
MONDAY, NOV 9, at 7 p.m.
All parents think their children are great. Alan Zuckerman just happens to think his three-year-old son, David, is the Messiah. Alan and his wife, Laura, visit their rabbi to discuss David’s possible divinity. Thirty years later, everyone older and wiser, it appears that Dad might have been onto something. 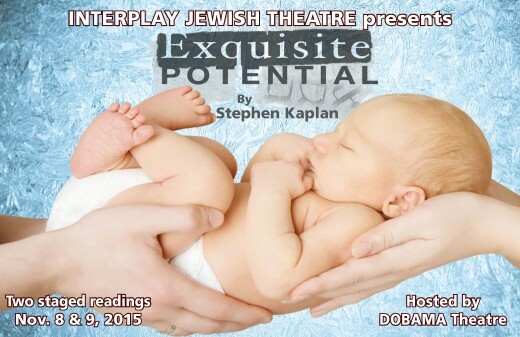 STEPHEN KAPLAN’s playwriting honors include: the New American Comedy Showcase Award (The Book of Daniel); semi-finalist for PlayPenn, Ashland New Play Festival, MTWorks’ Newborn Festival (A Real Boy); and New Jersey Playwrights Contest, DezArt Performs’ Reading Series, Across the Generations New Jewish Play Festival, and finalist for the Woodward-Newman Drama Award (Exquisite Potential.) 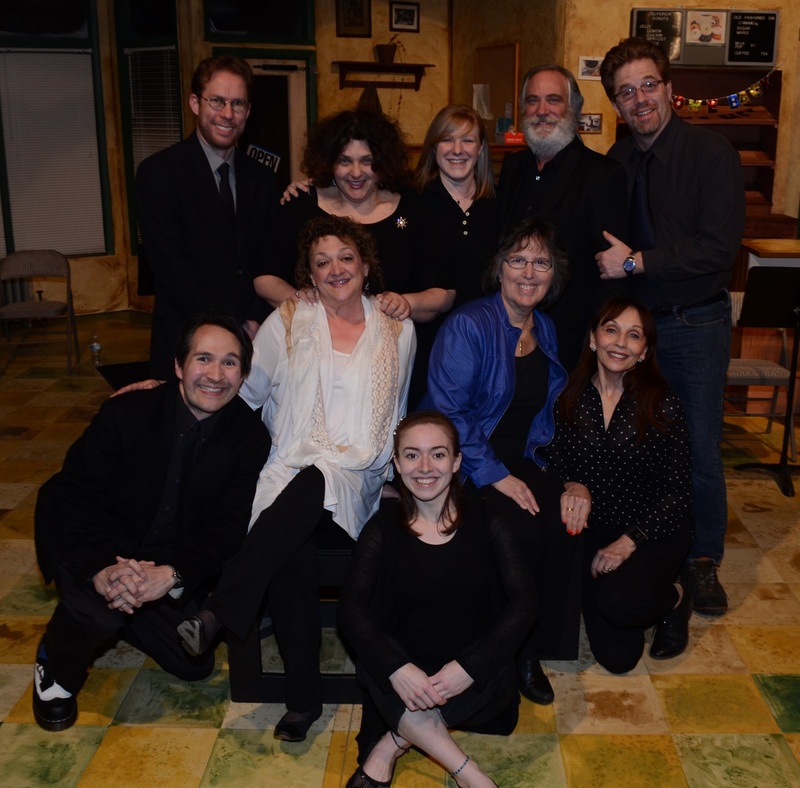 He is New Jersey’s Regional Representative to the Dramatists Guild. Stephen will attend the Sunday performance and lead a talkback. SUNDAY, JULY 12, at 2 p.m.
MONDAY, JULY 13, at 7 p.m. In this acclaimed off-Broadway play, a blocked young novelist travels to his cousin’s home in Poland, hoping to be left alone with this thoughts. He finds instead a 75-year-old survivor with an urgent need to connect with family she barely knows. As their stories unfold, the nature of “family” – and “connection” – becomes less and less clear. Jesse Eisenberg is an Academy Award-nominated actor, playwright and humorist for The New Yorker. His first play, Ascuncion, was nominated for a Drama League Award. His third play, The Spoils, recently opened off-Broadway. Among his film acting credits: The Social Network, Now You See Me, Adventureland, and Zombieland. Up next, he plays Superman’s nemesis in Batman v. Superman: Dawn of Justice. SUNDAY, APRIL 26, at 2 p.m.
MONDAY, APRIL 27, at 7 p.m.
Larry and Roberta, a well-meaning, well-to-do suburban couple, have rescued a Torah that survived the Holocaust and donated it to their synagogue. So why does the shul in the next town have one, too? G-d’s Honest Truth asks how far we will go to believe a story too good to be true. 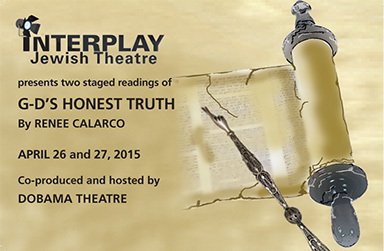 The play took first prize in the 2014 Jewish Plays Project international playwriting competition. RENEE CALARCO is a Washington, D.C. based playwright and proud founding member of the playwrights’ group The Welders. Her other plays include The Religion Thing (2013 nominee for Charles MacArthur Award for Outstanding New Play); Short Order Stories (2007 winner, MacArthur Award); The Mating of Angela Weiss, Bleed, and others. Her plays have been produced and developed by Theater J, Charter Theatre, Geva Theatre, Project Y, Adventure Theatre, Pinky Swear Productions, Doorway Arts, The Jewish Plays Project, and the Source Theatre Festival. The Welders will produce the world premiere of Our National Museum of the Unforeseen Tragedy in September 2015. 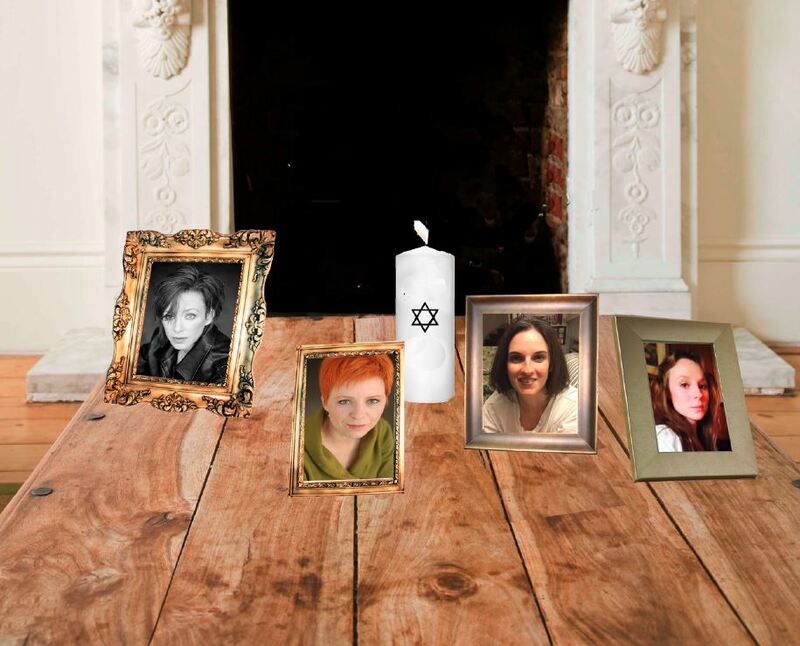 TUESDAY, SEPTEMBER 16, at 7 p.m.
Samantha Marcus is a progressive rabbi who wants only to live a good and decent life. She and her three sisters – a successful developer, a struggling tennis pro, and an emerging spiritualist – have all been out of touch for years. Following the death of their father, a hard-drinking, hard-driving union activist, they are forced to come together to examine their shared legacy and divide his estate. 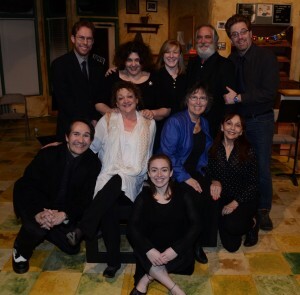 Divided Among Themselves was named one of the top 10 plays in the New York-based 2013 Jewish New Play Festival. HENRY W. (HANK) KIMMEL is a founding member and board president of Working Title Playwrights, an Atlanta-based theatre company dedicated to the development of playwrights and new plays. He has written dozens of plays, usually involving people’s obsession with status and money, and is approaching his goal of having his plays produced in all 50 states. Collections of his short plays have been produced by Jewish Theatre of the South (GA) and Center Stage Theatre (NY). When not resolving disputes on stage, he works as a mediator and tennis pro. He is a longtime member of the Dramatists Guild and is a graduate of Brown University and the Emory University School of Law.